Roof leaks are notoriously difficult to fix by repairs and patching and extremely costly to install a completely new roof. Here we’ll discuss the causes of roof leaks and some solutions. Here are some more common roof leaks. Below is another example of a Goo repair job. Please understand that no matter how much Goo you apply it’s still going to most likely end up like this. Repeated applications only means the cracked material is thicker than it was before. 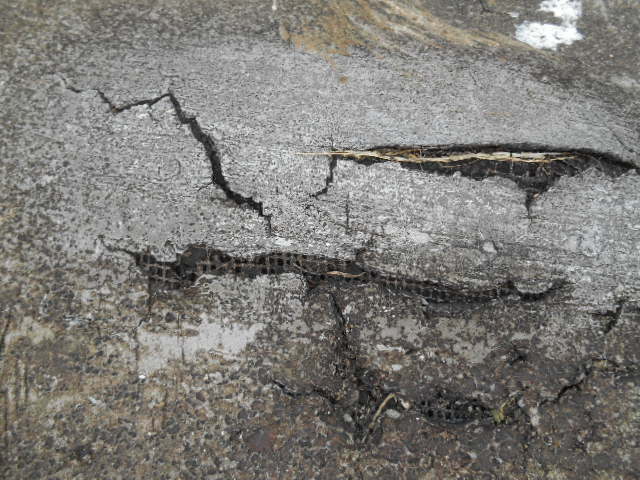 Whether it’s a 1/4″ thick or 4″ thick once it gets dry and brittle it will crack and it will leak. This is a very common area for leaks. 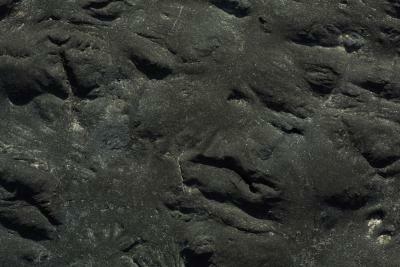 The seam at the top or even middle of a parapet wall. This seam was never flashed properly and never had a counter flashing installed. You need to mesh and mastic any seam on a parapet wall and then you should install a counter flashing like the in the image below. To solve this issue simply clean the area, apply a thin coat of our Roof Mastic and then work in some roof mesh with a serrated rectangle trowel until the mastic starts working it’s way up through the mesh. Then apply another layer of mastic just so that the mesh is no longer visible. Keep the mastic to a minimum, use just enough to seal and cover the mesh. The mistake most people make is that they just get up on the roof and start slapping gobs of goo all over the place. More goo is not better and is usually worse than less goo. Try our mastic and mesh method, we think you’ll like the results. Here’s a good example of restoring a roof with a commercial roof coating the right way. When done like this you will get as much or more longevity as an entire new roof at a fraction of the price. 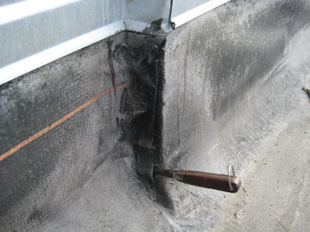 Notice that all the seams are covered with mastic and then the coating is applied over that. When you see or feel the first drips of water coming down from your ceiling or roof the first thing you tend to do is want to run to the store and buy a bucket of black tar to patch the leak. There are a few problems with this. First is the fact that where you see the water coming down is most likely not where the leak is occurring. So the first thing you should do is try to determine the source of the leak. This can be extremely frustrating and time consuming. Next thing you should do once you determined where the leak is from is figure out the best repair method. Applying roof patch is great at first and looks like this when you first apply it. Then you get sucked into the never ending patch trap. 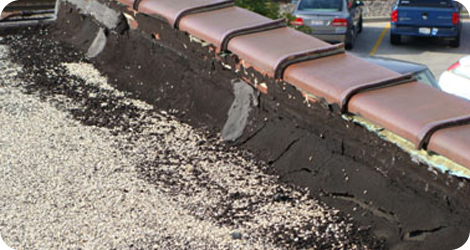 You are continuously applying patch to various areas of your roof and even trying different patch products. Until you end up with a giant mess on your hands and a still leaking roof. 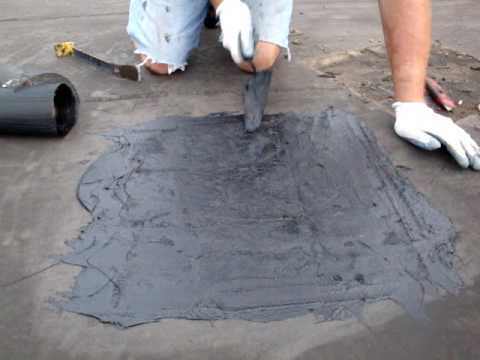 Tar based patch or black goo products like we call them are great for temporary emergency leak stop. But they’re not made for longevity. Once the sun starts baking them they get brittle and crack. Most times the cracks are not plainly visible and you think the patch is still good when it’s not. So you either miss seeing the leak or you just pour more goo on the problem. This a problem cause eventually you will want to fix the leaks properly and permanently. But with all that goo up there it makes it much harder to do a proper repair job. Keep the goo to a minimum and once it’s fully cured after a few weeks you can go over it with a permanent mastic or roof coating. If your applying goo all over your roof and it’s still leaking it may be that the roof material has just worn out and is now porous and water is working it’s way right through the roof membrane. Most times it’s cheaper, faster and a lot less frustrating to apply a roof coating over your entire roof. 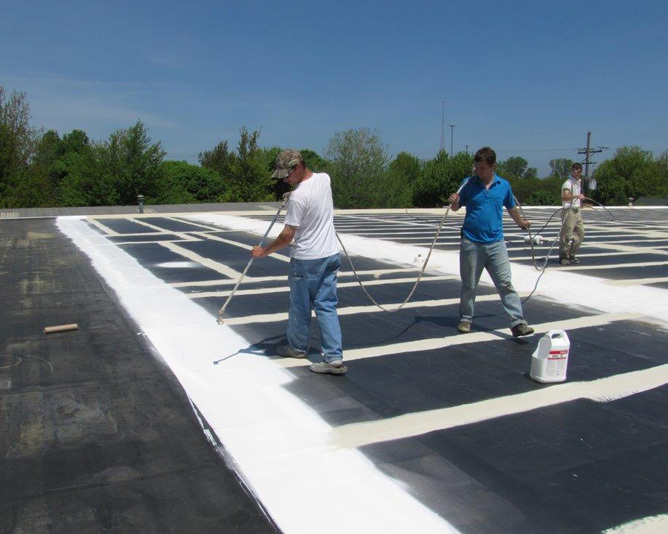 Our epoxy rubber based Roof Coatings are super strong and will seal up porous roof materials, fill in invisible cracks and other leak causing issues. Our Roof Mastic is far superior to any goo you will put on your roof. So in sum if your sure you have an isolated leak and have located it for sure, go ahead and patch it but at least use a high quality roof patch. If your leaks seam to be popping up in different places like the bump in a rug scenario. Don’t waste your time and money trying to spot fix it. Coat your entire roof and be worry free for the next 15-20 years. Leaks can be caused by almost an unlimited amount of reasons. Today we will discuss a few of the common reasons. Since there are so many reasons we will discuss other reasons in multiple posts. Thankfully, the best Commercial Roofing companies will always manage to prevent leaks from being a serious problem in your building. Here is a classic example of a roof leak waiting to happen. Notice the wood beams directly on the roof material! This is a huge no no. 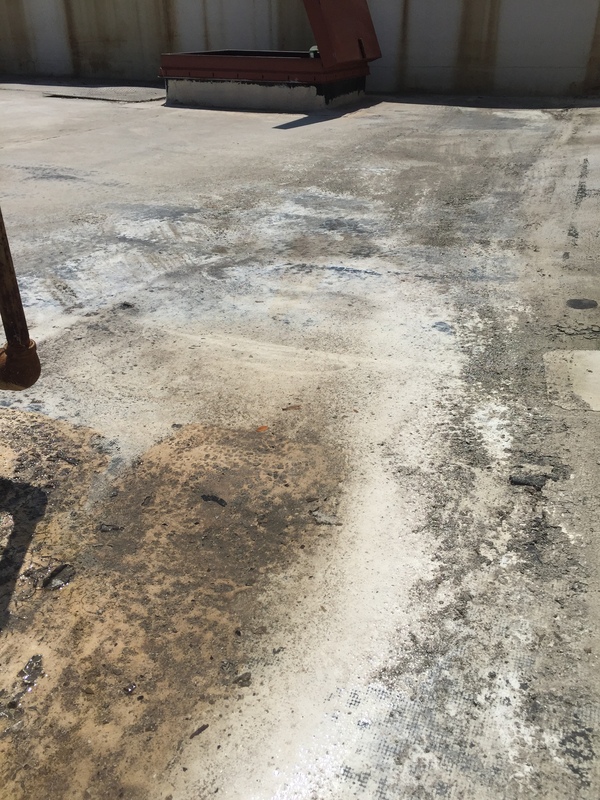 Never place any tonnage or curbing directly onto the roof surface especially if any vibrating equipment will be sitting on it. The vibration from the equipment will cause the beams or curbs to vibrate right through your roof material. Most times the cut occurs under the tonnage beams or curb flange where you can’t see it. Then the water runs under the roof surface and comes out of the first opening in the roof it hits. It could be on the other side of the roof. Leaving you to tear out your hair trying to find it while spending lots of time and money in your futile attempt to stop your roof from leaking. Here’s a picture of the right way to install equipment on a roof. See how the equip rails are cut into the roof and the roofing is run over the top of it. We also recommend you install vibration eliminators between any rotating equipment and the supports. You can use wood tonnage beams but they must be installed directly onto the roof deck and then properly roofed over. 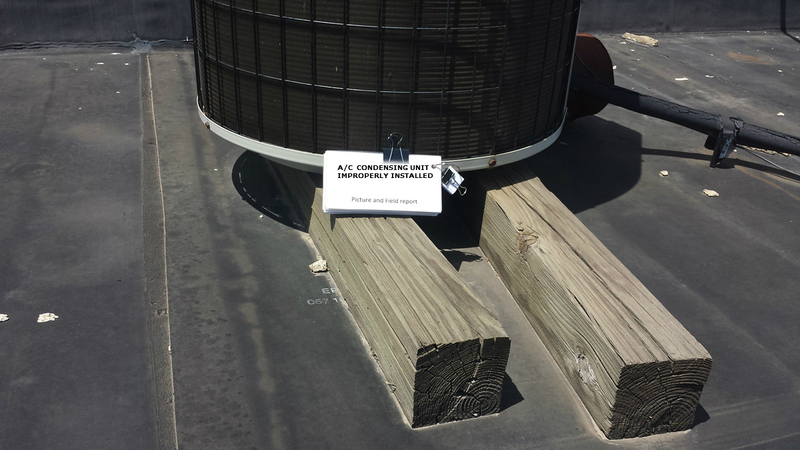 Notice the metal cap over the support rail. The equipment will never touch the roof material. Equipment support rails are commonly available online. Another common reason is this. Splitting seams. If you have leaks the first thing to check is your seams. You can do this by simply running your fingers a long the seams to see if there is any separation. 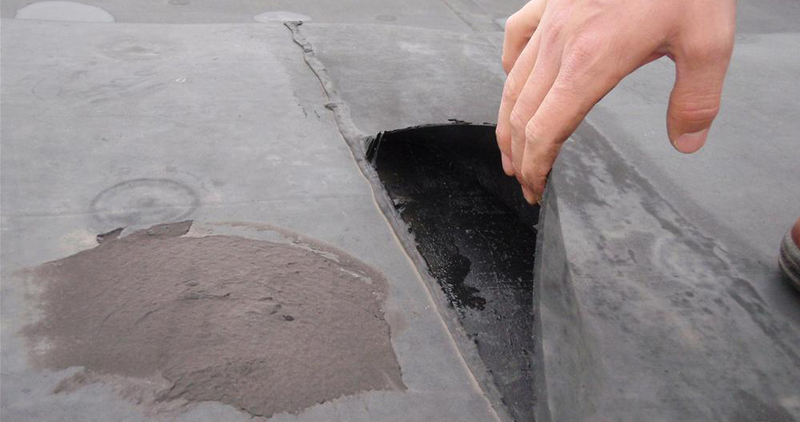 If you find a split seam we recommend our Epoxy Roof Mastic for the repair it’s far superior to the old fashion black tar stuff you get at your local store. Spread a little under the seam then cover the seam with a thin even coat, scrape in some nylon or fiberglass roof mesh with the notched side of your rectangle trowel until the mastic protrudes through the mesh then spread some more mastic to encapsulate the mastic. 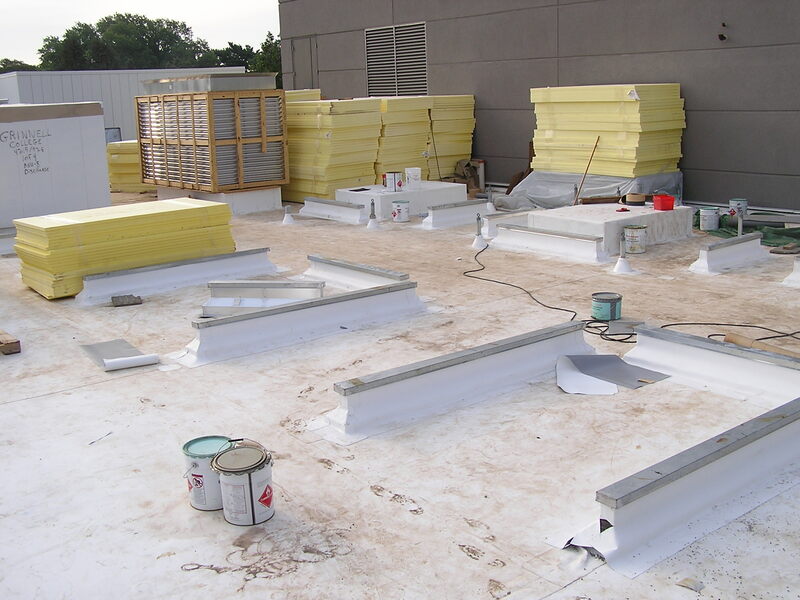 Paintable roof tape works best on rubber EPDM seams. 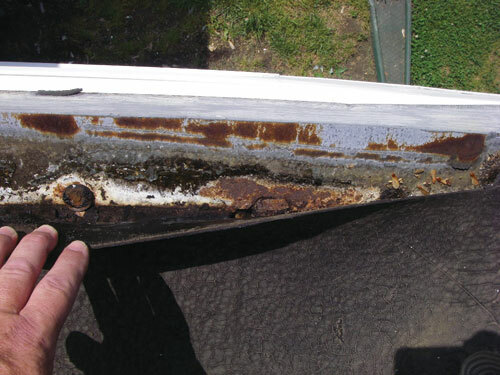 In future posts we’ll discuss why leaks keep recurring and other reasons your roof is probably leaking. See all the dark brown and black residue, that’s the tell tale sign of ponding water. You can also see the decomposing roof material also. Ponding water will eat through just about any roof material. 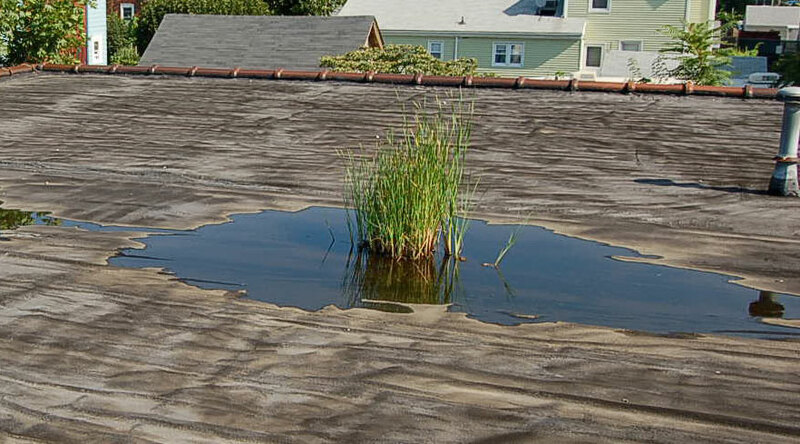 It is extremely important that before you begin any repairs or coating of your flat roof that you determine whether or not you have ponding water which is caused by improper pitch in the roof. If you do, you must thoroughly clean off all the residue with either a bleach or chlorine solution. Then you must coat it with a ponding water PROOF coating not just a ponding water resistant coating. Anything else you do will be a waste of your time and money such as using bargain coatings from home improvement stores. 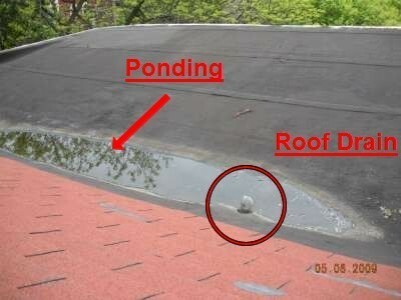 Here are some more obvious cases of ponding roof water. Having vegetation growing on your roof is never a good thing but is more common then you think.